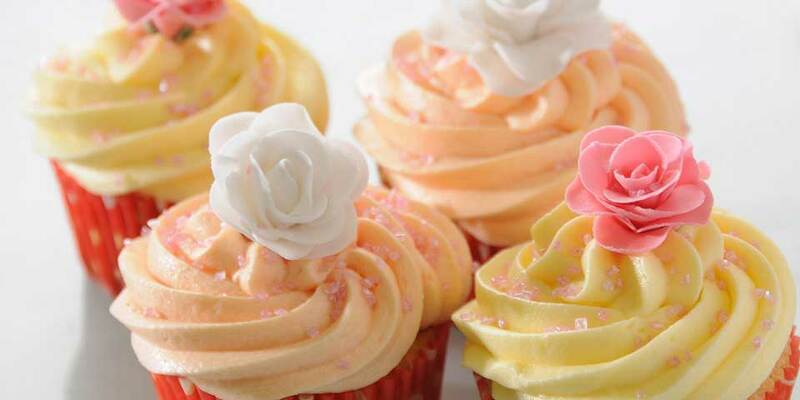 These easy to bake cupcakes are perfect for parties. Preheat the oven to 180°C/ 350°F/ gas 4 and place the cupcake cases into the muffin tray. Beat together the sugar, butter and vanilla extract using an electric mixer until the mixture is light and fluffy. Add one egg at a time along with a spoonful of flour to stop the mixture from curdling. Mix in the remaining flour then spoon the cake mixture into the cake cases. Bake in oven for 20 minutes, until the cakes have risen and are lightly golden. You can check they are done by inserting a wooden toothpick or cocktail stick into the middle. When it is removed it should come out with a few moist crumbs and no wet batter. Remove the cakes from the oven and cool on wire rack. While the cakes are cooling, beat together the butter, icing sugar and vanilla extract until it is light and creamy. Add your chosen food coloring drop by drop and mix until you achieve the colour you desire. Place in a piping bag with a wide star nozzle and pipe a generous swirl on top of each cake once they are cool.